Refreshments: 500ml water; OTE Sports energy bar; walnuts; Cafe stop food - pate, salad, almond and raspberry cake, coffee. I woke up feeling pleased that the challenge was almost over, save for the small matter of riding 80km to reach my journey's end in York. 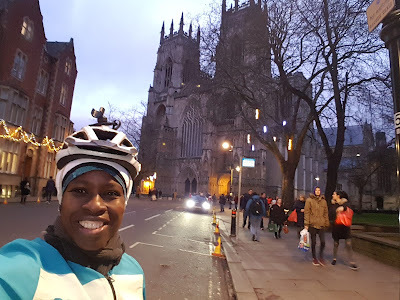 I had ridden to York before, going along the Transpennine trail, with a run into the city via the Selby-York rail trail. That route is largely traffic free and goes along farm tracks and canals. Today's route would also be mainly traffic free, but would go slightly further north, and via two rail trails. I was slightly nervous about what condition the Hudson Way and the Bubwith rail trails would be in, knowing that this would determine how long my ride would take. Having previously ridden the Hudson Way I knew that would be on a not-so-well manicured trail and could be slow going depending how muddy the trails would be after the drizzly conditions from weekend. 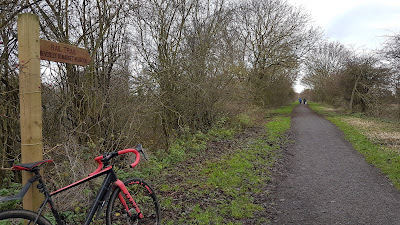 I had no idea what the Bubwith trail would be like, and guessed that it would be smooth given that that Google map had recommended it as a route from Market Weighton, where it had not recommended the Hudson Way when cycling from Beverley to Market Weighton. During yesterday's ride it took me almost 90 minutes to cover 10 miles, as the Longendale trail was in such a muddy state. Riding at that pace today was not an option today, so I was prepared to ride on the parallel road. The nearby roads were not particularly busy, but I wanted to stay as true as possible to the off-road theme for the Festive 500. At least the Selby-York rail trail would be fine as that is tarmacked. The main thing for me, was to get out of the house in a timely way - something which I had not done at all, apart from on the first day. On this day though, I made an effort, despite the sky looked uninviting. From my hotel in west Hull it was a pleasant traffic-free ride up to Beverley, and along the way the sun came out. Whenever I go to Beverley I normally like to stop off at Cafe Velo and look at the beautiful Minster, but on this day I preferred to just push on, as I did feel a slight sense of urgency. I would definitely recommend stopping at these two places though. Gary, who runs the cafe is a former racer and a very friendly guy too. And Beverley Minster looks as impressive as York Minster, but without loads of crowds. Anyway, it was onwards to the first rail trail, the Hudson Way, which runs for 10 miles from Beverley to Market Weighton. The initial section, to my pleasant surprise, had been surfaced and was now a wide gravelly, well drained trail. That didn't last long though, and afterwards, became a farm track, interspersed with short stretches of gravel, and then a descent surface in the last mile before Market Weighton. The trail also crossed a few country roads - sometimes with steps or steep slopes to take you down to and up from the roads. The main difference between this trail and other trails that I had done during the week was that the Hudson Way was not touristic. It was more like a local trail with comparatively few people on it, and locals taking their dogs for a walk. There was a picnic site at the disused Kiplingcotes train station, but it still didn't seem like a trail for a recreational afternoon out with the family. I guess most people would prefer to go out nearer to Beverley, with its pastures, or further into the Wolds in places like Millington Dale. Having said that there were some pleasant views of arable fields, some of which may have inspired the likes of David Hockney in his paintings of the area. One noteworthy thing along the Hudson Way, is just outside Market Weighton when the trail goes through the woods. I am not sure what St Helen's Well represents, but it added a splash of colour to my ride. With lots of colourful ribbons hanging from the trees it certainly made for something that broke the monotony. If anyone knows what the tradition is here I'd love to know! 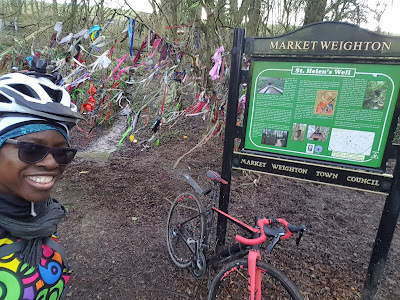 After Market Weighton, I then reached the Bubwith rail trail. This was not the easiest path to find. It did involve going along a 3-mile stretch of the main A614, and it was only by keeping my eyes peeled that I found the right-hand turn to get onto the trail. In fact, initially when I found the gap in the hedge I wasn't sure if I had reached the correct place, but after riding for around 400m I found a sign-post marked "Market Weighton-Bubwith Rail Trail". Then it was just a case of going straight on for around 10 miles. This was barely a rail trail at all. It was a narrow track, sometimes a single track and there were no tell-tale cycle tyre tracks to show this path was used by cyclists. There were just horse-hoof marks for most of the way with the ground being cloddy, and in some places churned up by the horses. All along the way were paddocks and nearby stables. 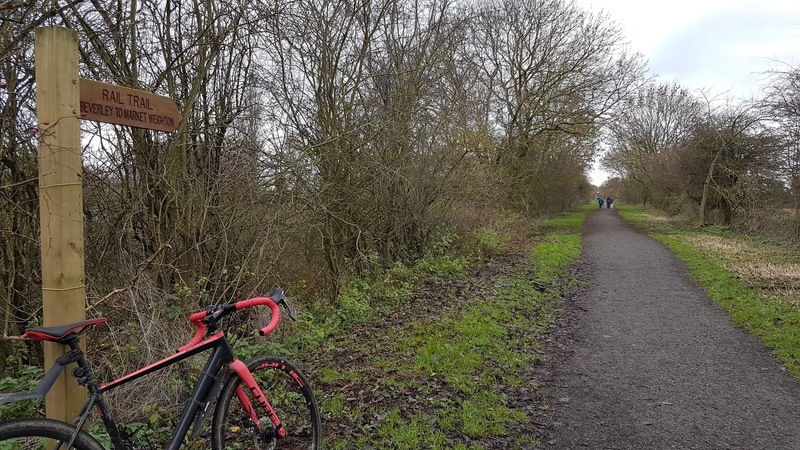 It felt like I was in a cyclocross race - especially because I was working hard, trying to ride quickly over this challenging terrain, and removed my jackets on this mild winter's day. Over the 10-mile stretch I saw two or three walkers and just one cyclist, but I did see five horse riders. The trail seemed hidden away like a little secret just for the landowners in the area and their horses. There was practically no human life around; the horse was definitely king! Needless to say there was no picnic site! In fact, I kept thinking someone might pop up and have a "get off my land" moment! The route was pretty bumpy, and well suited for mountain bikers, though the Cube Nuroad, with its Schwalbe G-One tyres still coped fine. Then, just when I was wondering how long I could be bumped around for, the path finally reached Bubwith, and my bottom got some rest. At this point, I began to feel good about the fact that I was now in the county of North Yorkshire, and therefore not so far from York. After a pleasant interlude through the Skipwith Nature Reserve I arrived at Riccall and picked up the final rail trail of the day, the Selby-York rail trail. This was on lovely smooth tarmac, albeit with ruts from pushed-up tree roots, but it was straight-forward. It was completely straight and flat, and child's-play to navigate. This is a popular path, used very much as a commuter link between York and Selby. As commuter paths go it is scenic, with various sculptures along the way related to the solar system and the planets. On this day there were a few challenging moments when I was buffeted by a few gusts on this slightly windy day. Although there were plenty of sections to take a seat along this nine-mile stretch. I sucked up the wind and focused on reaching my destination - York Minster. Once the path ended, the run into York was easy to follow. From the racecourse it was a case of following the Transpennine Trail signs which led to the River Ouse, and before I knew it I was in York City Centre. However, at that point my Garmin was only showing 75 km on the counter. So I carried on along the riverside, up to the Youth Hostel and then rode back into the centre of York on the opposite side of the Ouse, to reach Lendal Bridge and York Minster. I had done it - and before sunset! 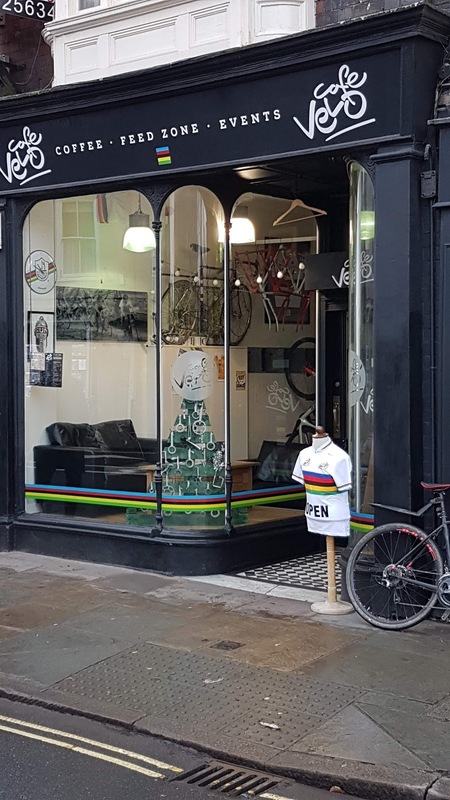 I couldn't have chosen a nicer place to end my Festive 500 - on the last day of the year, in front of one of the most famous landmarks in England. After taking a couple of photos I had a celebratory snack at Cafe Concerto, opposite the Minster. It had been a varied and pleasant ride, and is highly recommended. These 500km covered this week have taken me to different parts of England and it's been an enjoyable ride. It's a bit of a blur now, but I'm glad I took enough photos to remind myself where I went and the nice time I had.